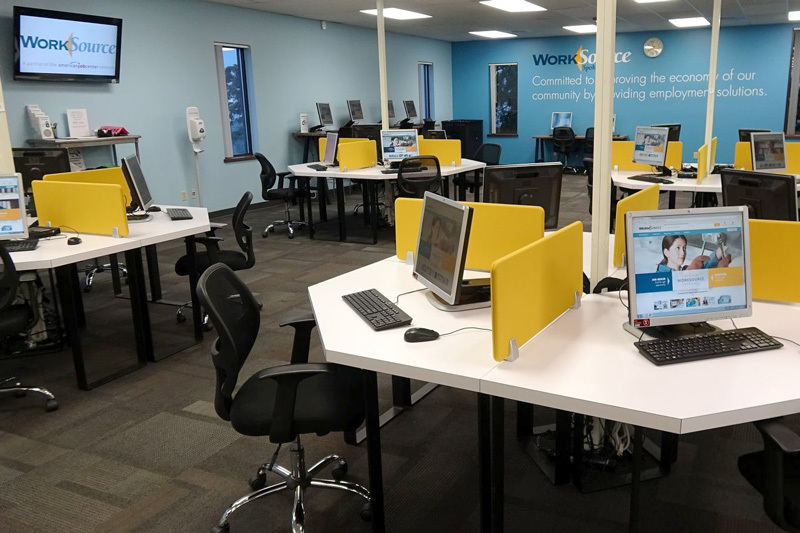 WorkSource Spokane is designed with the customer experience in mind. 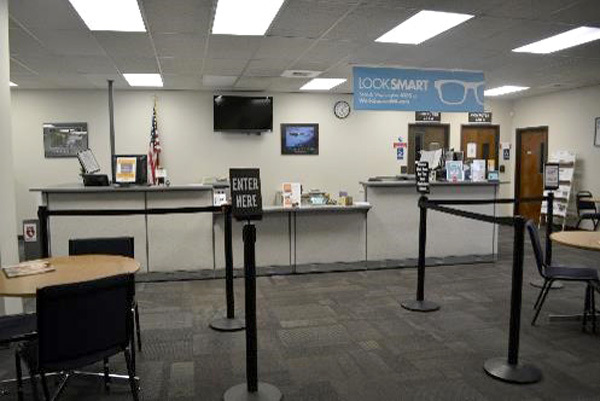 With the passage of the Workforce Innovation and Opportunity Act of 2014 (WIOA), we were afforded more freedom to organize and design WorkSource Spokane than ever before. In early 2016 we began an in-depth review of the customer experience and began work on a complete transformation of the center, physically and functionally. 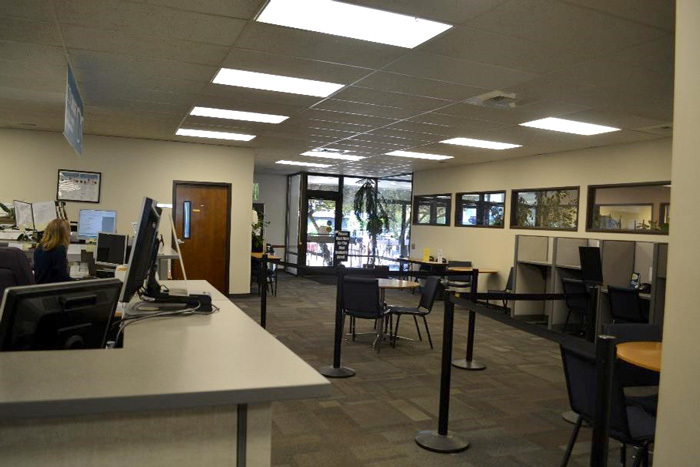 By the close of 2017 the center had been remodelled and re-organized to maximize the customer experience and make the staff more effective in their work. HCD is a collaborative, discovery-based process involving research, identifying patterns and surprising insights, brainstorming new ways to serve customers, prototyping, and testing. Most new processing begin in the brainstorming phase, skipping research. In HCD, research is critical to understanding the customer experience and being open to surprising discoveries. Questions during HCD research have to dig deep. For example, we surveyed customers and asked what they liked best and least about WorkSource, which revealed many valuable insights. During the redesign prototyping process, our goal was to resolve issues that were revealed from our question about what customers liked least about the center. In early 2018 we are still in the testing phase of our new program design, gathering feedback from customers and staff and making tweaks as needed. We are still working to finish remodeling some parts of the center. 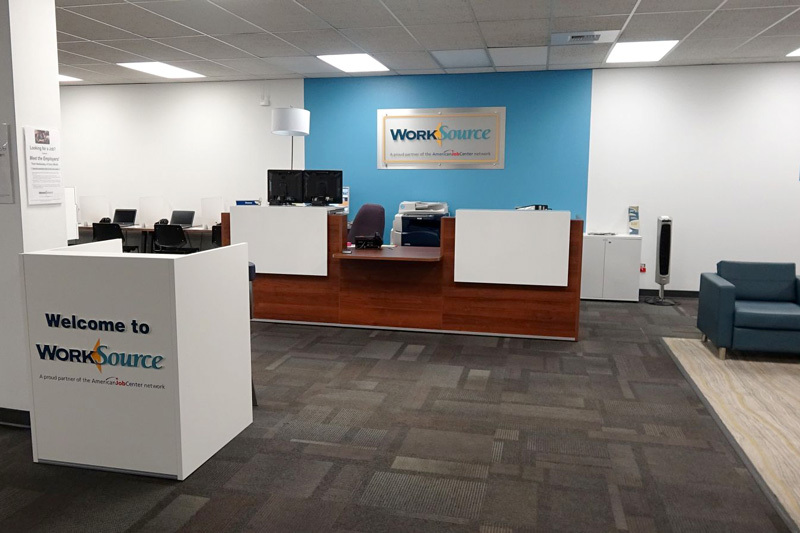 WorkSource Spokane is a collaborative environment that houses programs and staff from a variety of agencies and funding streams. In the past, these were all silo’d into their own section of WorkSource, making the customer flow experience very confusing and creating barriers to camaraderie among staff. Under WIOA, we had the freedom to implement Integrated Service Delivery, or ISD. ISD allows us to align and braid resources behind the scenes so customers don’t need to worry about which program they are enrolled in. It’s a model for organizing staff into functional teams rather than program-based teams. Along with the process we have launched co-enrollment between WIOA Titles I and III, which allows us to serve more customers. Although the design process focused primarily on the customer experience, leadership recognized that change can be difficult for staff and worked hard to listen to concerns, mitigate disruption as much as possible, and provide encouragement and support throughout the process. 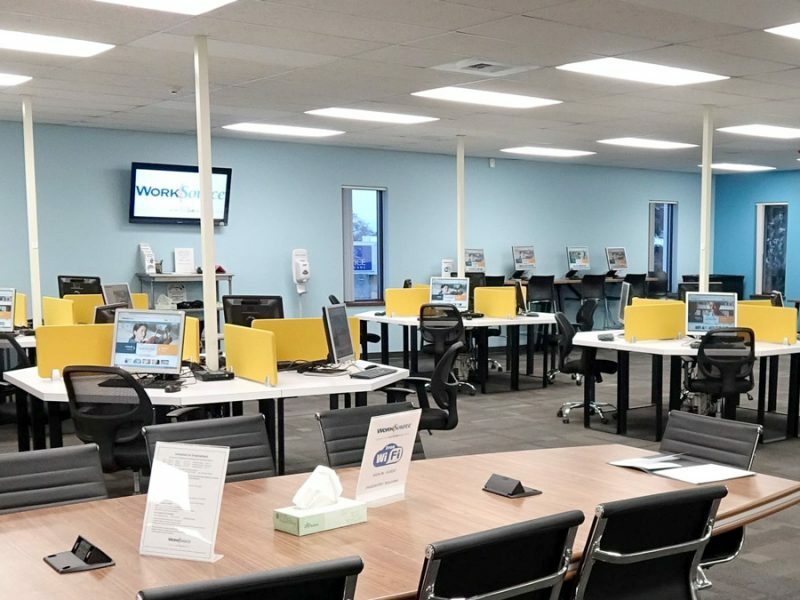 Staff have risen to the occasion, and as they see improvements in the physical space and customer service have become proud of the new center. The old lobby was not a comfortable place to wait. It has been re-designed with both comfort and style in mind. 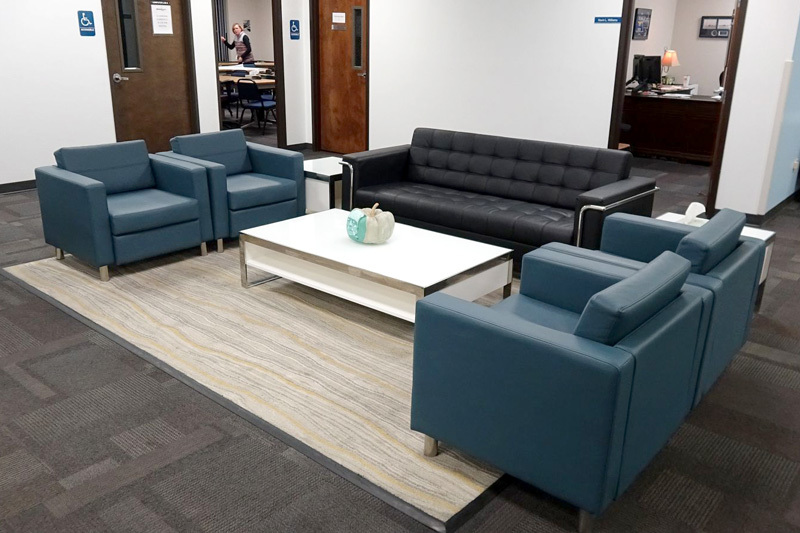 In addition to a living-room style seating area, it includes a space where customers can get coffee, and has bar-height tables for quick networking meetings or other work. In re-designing the resource room, leadership worked in close consultation with representatives of the community who have various disabilities to make the space as accessible as possible. Tables were designed to provide enough space for a staff member to pull a chair up beside customers with wheelchairs. 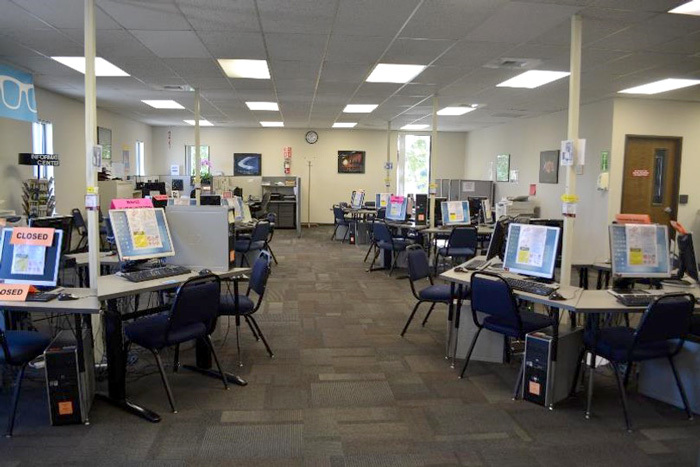 Taller workstations are positioned along the walls for customers who need to stand, and stools are provided for those who are short in stature. 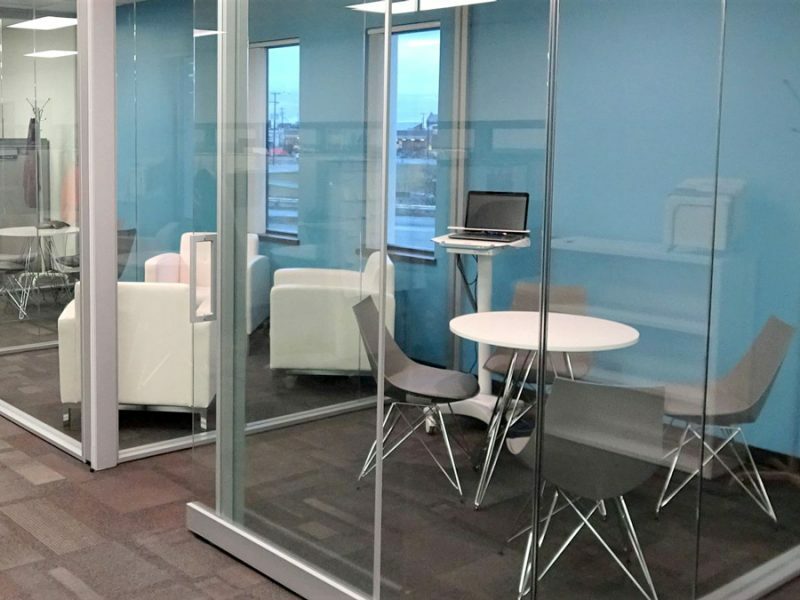 In addition, glass meeting rooms were installed to mitigate noise for one-on-one meetings and when the language translation phone service needs to be used. New paint, signage, and furniture has made the space more welcoming, comfortable, and modern. Although the economy is stronger and the unemployment rate is lower than it was before the re-design started, customer numbers and engagement in the center have increased dramatically. Staff work stations have been re-organized around functional teams rather than programs. For example, in the old system two different people looking for work might receive two completely different types of service depending on which program they were eligible for. This led to inconsistent service as different staff members would assess needs, make résumé recommendations, and find job leads in different ways. Now any two people who walk in the door will receive the exact same service while specific program eligibility is handled in the background. All customers start out with the HUB with access to career coaches. Those who need additional assistance have access to one-on-one coaching as well as various workshops and trainings. Below are diagrams of how WorkSource used to be organized, and how it’s organized now.